The Royal Air Force celebrates its one hundredth anniversary in 2018, and it's perhaps fitting to reflect that just as the RAF has its origin in World War 1, so does its official march, the RAF March Past. The work's jaunty opening section, which its composer Sir Henry Walford Davies intended to call the Adastral, is based on the combined bugle calls of the Royal Flying Corps and Royal Naval Air Service. However, it is the lyrical Cantabile trio composed one year later that gives the work its heart, and this section was entirely composed by Major (later Sir) George Dyson. The unexpected introspection of the central section, not often heard in upbeat regimental marches, is perhaps down to the recent experience of its composer. Dyson had only just emerged from a period recuperating from shell-shock after a very near escape at the Western Front. He replaced Walford Davies to become director of music at the newly-formed RAF. Prior to the War, George had held the position of music schoolmaster at Marlborough College, and had only just taken up similar a post at Rugby School when war was declared in August 1914. 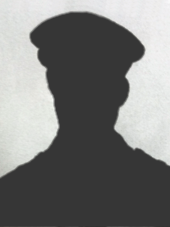 He enlisted immediately and was thus was placed into one of the 'Public Schools Battalions' formed in White City in Shepherd's Bush, London, although his background was far from a public schoolboy. George came from a working class background. He was born in Halifax, his father John William Dyson was a blacksmith and his mother, Alice, a weaver. Both his parents were musical, being members of amateur choirs, and encouraged their son in this direction. His father was the organist at the local Baptist church, where George had his first musical experiences and began taking organ lessons from an early age, passing his Fellowship Diploma from the Royal College of Organists aged 16. From there he gained a scholarship to the Royal College of Music in 1900 where he studied composition with Sir Charles Villiers Stanford. Stanford's late Romantic idiom was to have a profound influence on George, and his style was always tonally conservative. After completing his studies, at the encouragement of Stanford, George travelled to study in Italy, Vienna and Berlin, where he met Richard Strauss, whom he greatly admired. On returning to England in 1907 he became musical director at the Royal Navel College Osborne on the Isle of Wight, later moving to Marlborough College in 1911. Thus, from a humble background, Dyson seemed very 'establishment', an impression he was to retain. He was assigned to supervise the training of his troops in grenade warfare. Finding there were few instructions available on this crucial topic for soldiers going to the trenches, with typical efficiency George wrote a booklet called Grenade Fighting: The Training and Tactics of Grenadiers. The content was based on exercises he had developed in training and information gleaned from British Expeditionary Force soldiers on leave with experience of the trenches. 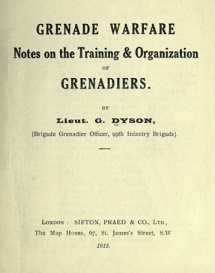 The book was small enough to fit in a jacket pocket and, while his initial introduction suggests it was a stop gap until an official manual was written, it ended up being printed and distributed in its thousands, becoming the de-facto grenade training manual in both Britain and the United States after they entered the War in 1917. In his autobiography Fiddling While Rome Burns George recalls the publication gave him 'A martial reputation which was quite incongruous and still occasionally dogs me' (Dyson, 16), but the royalties earned from the publication secured him a steady secondary income. Posted to France, George's battalion, the 22nd Battalion Royal Fusiliers (part of the 2nd Division), was frequently moved around the lines. He spent a nervous period at Givenchy in the western section of the trench line near Lille, which was reputedly hot and 'unhealthy' (Spicer, 98). George was to particularly single out this location as the worst he experienced. Lewis Foreman details a letter of 5 December 1915 in which George describes being "continually under shellfire...Our own guns are blazing away like mad, so that you can’t hear yourself think...The trenches are simply vile in this weather. Between knee-deep and thigh-deep in mud, in addition to the havoc wrought by the Bosch." Between front line postings, much of George's battalion's time was spent at various billets where he was able to perform at concert parties and organise entertainments. As noted by most soldiers of the Great War, the majority of time was spent doing very little, waiting for orders, interspersed by periods of intense action and danger. These periods of waiting around are credited as the reason so many soldiers became poets or birdwatchers, often at the same time. The conditions were less conducive to composition, but during one of these periods at the Front, George completed a set of piano miniatures, the Epigrams (1916, published 1920) and unpublished miniatures An Autograph (1915) and Sostenuto ed espressivo (1916). Dyson's biographer Paul Spicer notes that the manuscripts of these works are tightly folded, suggesting they had been carried around in a pocket book (Spicer, 100). On October 31st 1915, he received a visit from a fellow RCM alumnus, the Australian composer Arthur Benjamin, who was later to join the Royal Flying Corps in 1917 and be shot down by Hermann Göring, spending the rest of the war in a prison camp. (Spicer, 100). During a brief leave in February 1916, George visited Sir Hubert Parry at the RCM, who noted in his diary that the composer seemed "very depressed". Back at the Front in March 1916, disaster struck. While riding during an artillery bombardment, a shell landed immediately under his horse. He remembered nothing of the explosion, but awoke "uninjured but lying in a pool of blood and minced horseflesh" (Freeman Dyson, Weapons and Hope, 106). This shocking experience led to George suffering from fainting fits, and by the end of the month he had been diagnosed with shell shock and "struck off the strength". He returned to England shortly afterwards where he was 'a long time convalescent' (Dyson, 16). He would not have to return to the Front again. A close friend of George's, Captain Freeman Atkey, a classicist whom he had known at Marlborough was killed on 5th July 1916 while serving with the Yorkshire Regiment. Travelling to Yorkshire offer his condolences to Freeman Atkey's family, George became friends with Freeman's older sister, Mildred. This friendship developed and they were married later that year. George and Mildred were to have two children; Alice (born 1919) and Freeman (born 1923), the famous physicist. Wishing to continue his service, George joined the newly-formed Air Ministry. After Henry Walford Davies left the post of Organising Director of Music in August 1918, George was appointed to his post with the same rank of Major. With typical efficiency, he reorganised the bands and laid the foundations for the College band at Cranwell. He composed a set of trumpet calls for the RAF, recorded in 1941 by R.P. O'Donnell conducting the RAF Central Band. However, his most enduring legacy at the Royal Air Force is the completion of the 'March Past'. Not only did he compose the trio section, but he also arranged it from Walford Davies's piano sketch. The fingerprints of Dyson are all over the central trio section; slow it down, as Wing Commander Barrie Hingley has in his Elegy on the RAF March Past and it becomes clear how similar the structure and melodic contours are to Dyson's 'Poor Parson of a Town' from The Canterbury Pilgrims (1930), which, like the trio, forms the emotional heart of that work. "Cantabile" hints at Dyson's suggestion that the trio could be used as the basis for a song. The Canterbury Pilgrims, Dyson's setting of Chaucer's General Prologue to the Canterbury Tales is a witty and accessible work full of great tunes. It remains Dyson's best-known work, but is not performed regularly. Indeed, he is remembered today as much for his efficient administration of the Royal College of Music (particularly during the Second World War) as his own compositions. He was very proud to be the first pupil of that institution to become Director there, amply stepping into the big shoes of his predecessor, Sir Hugh Allen. Dyson was knighted in 1941. Where every bar is discordant, with respect to whatever conventions the listener has been trained to accept, the music has no sense to make. It is all completely out of focus. Whatever values or distinctions the composer may have in his own mind, he cannot bypass the limitations of his listeners. His reputation has been boosted by a series of excellent recordings of his works, particularly by Richard Hickox on the Chandos Label. These include his neglected choral works such as Quo Vadis of 1939 which show a composer of great depth. Paul Spicer's 2014 biography suggests that like other composers who experienced World War 1, Dyson preferred a more poetic and philosophical outlook, rather than a spiritual one (161); his son Freeman recalls a Christian framework in his household, but little explicit religiousity. Spicer paints a portrait of a slightly aloof figure, but one whose works exhibit both his dry humour and a desire to appeal to the everyday concert-goer and choral singer; maybe people like his parents.